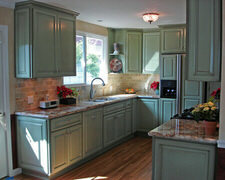 Schlabach Wood Design is a premium cabinets maker and supplier in Baltic, Ohio. Whether your dream is for a contemporary Italian kitchen, traditional kitchen or designer kitchen, Schlabach Wood Design can help you achieve it. We complete all designs in Baltic area and are able to satisfy new home, renovation, or apartment development projects.